Keep this tin in case of chocolate emergencies. 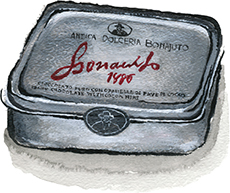 This tin box holds six bite sized truffles studded with crunchy, slightly bitter pieces of cacao beans (aka nibs). Nutty, slightly sweet, amazing texture.